Robert Clements of Elmwood will fill the legislative seat left vacant by the resignation of Sen. Bill Kintner last month. Gov. Pete Ricketts announced the appointment at a press conference Feb. 6. 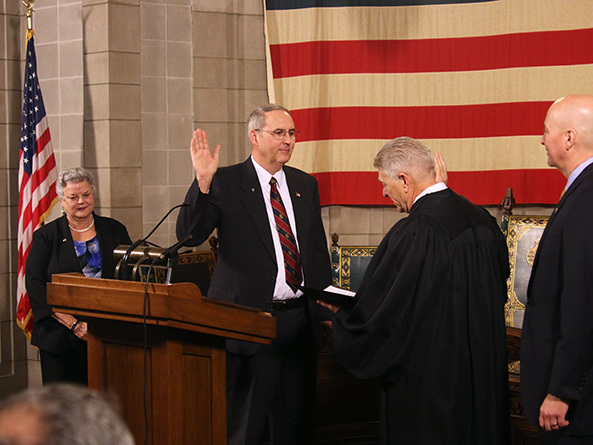 Thirty-five people applied to fill the seat, Ricketts said, and he interviewed several before settling on Clements, who was sworn in by Nebraska Supreme Court Chief Justice Mike Heavican after the announcement. Clements, executive vice president of the American Exchange Bank, graduated from the University of Nebraska-Lincoln in 1973 with a degree in math and minors in economics and actuarial science. He worked as an actuary in Kansas City until 1978, when he returned to Elmwood to work at the American Exchange Bank. Clements and his wife Peggy have five children and 10 grandchildren.